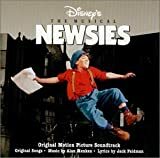 Accueil Bande originale Paroles Chansons Carrying the Banner – Paroles de la chanson dans “Newsies”. Carrying the Banner – Paroles de la chanson dans “Newsies”. Hey, bummers, we got work to do. Since when did you become me mudder ? Hey! Who asked you ? Try Bottle Alley or the harbor. Try Central Park, it’s guaranteed. Try any banker, bum, or barber. Met this girl last night. For a buck, I might. Ain’t it a fine life. Carrying the banner through it all ? Carrying the banner tough and tall. We goes where we wishes. We’s as free as fishes. Carrying the banner home-free all. It takes a smile as sweet as butter. The kind that ladies can’t resist. It takes an orphan with a stutter. Who ain’t afraid ta use his. Summer stinks and winter’s waiting. When youse gotta walk ? Still, it’s a fine life. Carrying the banner with me chums. Blowing every nickel as it comes. Carrying the banner through the slums. Though you wander lost and depraved. Since you left me I am undone. Just gimme half a cup. Something ta wake me up. I gotta find an angle. I gotta sell more papes. Papers is all I got. Wish I could catch a breeze. Sure hope the headline’s hot. All I can catch is fleas. God, help me if it’s not. If I hate the headlines. I’ll make up the headline. And I’ll say anything I hafta. ‘Cause at two for a penny. If I take too many. Weasel just makes me eat ’em afta. Look! They’re puttin’ up the headline. You call that a headline ? From the copper on the beat. I was gonna start at twenty. Now a dozen’ll be plenty. Tell me, how’m I gonna make ends meet ? So where’s your spot ? How’m I gonna make ends meet ? We need a good assassination. We need an earthquake or a war. How ’bout a crooked politician ? Hey, stupid, that ain’t news no more. Uptown to Grand Central Station. Still we’ll be out there. Carrying the banner man to man. Soakin’ every sucker that we can. Carrying the banner is the. Look, they’re puttin’ up the headline. They call that a headline ? The idiot who wrote it. Must be workin’ for the Sun. Did ya hear about the fire ? Heard it killed old man Maguire. Heard the toll was even higher. Why do I miss all the fun ? Hitched it on a trolley. Meet ‘cha Forty-fourth and Second. Bleecker’s further than I reckoned. On the corner someone beckoned and I. Would you look at that headline ? I was gonna start with twenty. Would you tell me how’m I ever. Gonna make ends meet ? On the corner someone beckoned. You got ’em now, boy. Try Central Park it’s guaranteed. Try any banker bum or barber. Specs, Itey and Snipeshooter-Welcome to New York. Boy ain’t nature fascinating when you’s gotta walk. It’s a fine life carrying the banner.